One of the key advantages of Self-Directed IRA investing is its tremendous flexibility: While retaining all the tax advantages of using conventional IRA accounts, self-directed investing also allows investors to range far and wide in search of assets that would effectively diversify against the behavior of a retirement portfolio that’s heavy on U.S. large cap stocks (think the S&P 500) and U.S. investment grade bonds that dominate most Americans’ retirement accounts. Now’s the time to consider diversifying into a Self-Directed IRA. That’s important today, as stocks continue to flirt with all-time highs (though in recent days, as of this writing, we have seen some significant downside volatility starting to show up in the stock market), and as interest rates continue to rise. Both portend danger ahead for those investing primarily in Wall Street paper assets. If you are not already diversified into other types of asset classes, now would be a good time to consider making some moves. Conventional diversification measures and asset allocation is getting less effective over time. Buying international stocks is no longer the diversifier it once was. During the 80s, the correlation coefficient between international and U.S. stocks was less than 0.50. That is, international stocks offered a meaningful way to maintain exposure to the long-term expected returns, while even a small addition of these more volatile assets could help offset the short-term volatility of the S&P 500. But much of that diversification benefit for international stocks has vanished: Since 2000, the correlation coefficient of international vs. U.S. equities has increased to more than 0.87 through the end of 2016. Investors looking for substantial diversification against the S&P 500 must get more creative. According to this matrix from Morningstar, the most effective diversifiers against the performance of U.S. large cap stocks are cash (with an only slightly positive correlation coefficient of 0.052), commodities (0.141), U.S. investment grade bonds (0.230), emerging markets stocks (0.537) and real estate (0.588). But cash tends to get swamped by inflation, bonds are getting drowned by a rising tide of interest rates in the short-term, and commodity investing is not palatable to most people, except as an inflation hedge. 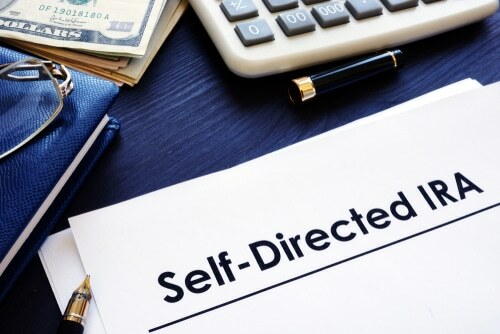 Self-Directed IRA investing allows investors to take a much more granular approach to asset allocation and invest with a rifle scope approach rather than a scatter shot approach that most investors limited to fund and index investing must take. A REIT fund would likely behave very much like the real estate asset class as a whole, unless it was carefully targeted at a specific niche market. But any given rental property can behave radically differently from a REIT index, simply because so much of real estate investing is governed by hyperlocal trends, local employers, schools, tourism factors, seasonality and, of course, the investor’s own effort and skill in unlocking value in a closely-managed rental property. Investments in tax liens and certificates would likely tend to generate positive returns even in falling interest rate markets – and therefore be an effective diversifier. Both of these assets lend themselves very well to Self-Directed IRA investing – they are easily managed using a third-party administrator like American IRA, LLC, and investors can exercise very close control of these transactions without having to leave the decisions up to a money manager many hundreds of miles away. This home court advantage can be invaluable for investors – and can be had without paying crazy ‘2-and-20’ fees to hedge fund managers. In fact, due to the nature of the Self-Directed IRA market, American IRA is able to forego the inefficient expense ratio/AUM fee pricing model and charge a low flat fee for each transaction. In many cases, this saves hundreds and even thousands of dollars per year – especially on larger accounts.